Royal Philips has introduced the new data sharing, analytics and visualization platform, IntelliSpace Portal 8.0, at the 2015 Radiological Society of North America Annual Meeting (RSNA) in Chicago, US. The new platform, which helps radiologists detect, diagnose and follow-up on treatment of diseases, provides effective 3-D quantitative renderings of tumors. With automated and guided workflow, it enables clinicians to visualize, diagnose, measure disease states and communicate across modalities. The new platform supports more than 68 clinical applications for seven modalities, including CT, MR, ultrasound, mammography and iXR. Philips healthcare informatics solutions and services CEO Jeroen Tas said: "Radiology has a unique ability to influence and improve outcomes. Today there is so much data available, but its full potential is not often realized. "Advances in digital health technology now allow us to integrate clinical data from multiple modalities and sources and make that data meaningful and quickly accessible to radiologists." IntelliSpace Portal 8.0 is incorporated with new CT lung nodule assessment (LNA) application that provides effective and longitudinal workflow. The platform also features applications that will help clinicians to measure and track COPD, detect pulmonary emboli and perform calcium scoring. Its MR cardiac quantitative mapping provides fast quantification and analysis workflow for T1, T2, and T2 generated maps to enhance the diagnostic view in cardiomyopathies. 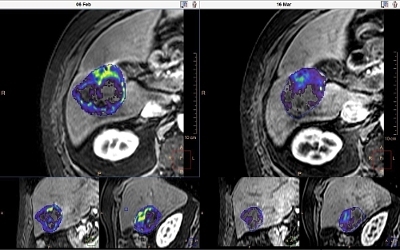 Image: Quantitative tumor viability (qEASL) before and after chemoembolization (TACE). Photo: courtesy of PRNewsFoto / Royal Philips.